Beautiful 2 bedroom 2 bathrooms condo in a high rise building on the 11th floor. Views of the rocky mountains from the patio, located above a golf course. The high rise has access to a seasonal outdoors heated in ground swimming pool, exercise room, vending machines in the lobby, ample parking and hair salons located on the main floor. The kitchen has been updated and spectacular, equipped with all the convenient appliances. There are restaurants located nearby from fast food or sit down meals. Hawks Nest is equipped with wi-fi, big screen television, DVD player and a wide assortment of movies for your entertainment pleasure. Hawks Nest is located minutes away from many tourist attractions which have made Colorado Springs well known across the country. The building is secure with personnel at the from desk and a security guard on premises after 11:00 p.m. Gaining entrance to this property is by electronic deadbolt lock for your safety. Code will be assigned at check-in. Hello future guest, I was born and raised in Denver and still live in the area with my wife who also has a condo listing #797076. I have traveled thru out the country but Colorado will always be my home. (And Favorite!) I love the weather, summer activities and the Colorado life style. Even though I am not a skier myself, the news is it is one of the best places to ski. For those that don't ski, the mountain scenery can't be beat! The snow capped peaks are beautiful! The activities in the Colorado Springs are numerous!! Something for everyone. Many people come for a vacation and decide to move here!! I feel for families and single people the area has a lot to offer. The condo is centrally located to many of the attractions. A 20 minute drive gets you into the mountains. The condo is part of the old Satellite Building where my guest can book rooms for the extended family or friends. The outdoor pool is heated for the cooler Colorado nights until 10pm. Both men and women workout rooms.There are hair salons for men and women. A massage company to relax in. Even a religious program for those that want to participate in. My condo is situated perfectly in the building with the most beautiful views of the mountains, the golf course and the pond. At night the city lights are seen from all the floor to ceiling doors in both bedrooms and the large living room. My patio is the length of the entire condo with plenty of room to entertain company. It is covered of course to protect you from the weather and some of the wind. Fun Fun!! toilet, combination tub/shower, Guest bathroom across from small bedroom. toilet, combination tub/shower, This bathroom is part of the master bedroom. An en suite!! central air. (Warning! The heat and A/C is run on the same system with water control. The HOA switch over to heat usually by September 1st depending on the outside temps. I do have a fan in each room. Washers and dryers are located down the hall and are coin operated. same. $1 per load. Machines on each floor. Hugh off street parking lot with lots of handicap spaces. If staying more than a few days you are encouraged to register your car at the front desk. Lot is regularly patrolled. Your responsibility. A minimum of 4 towels and 4 wash cloths. Ask if that is not sufficient for you. Double recliner and large sofa sleeper couch. French door with freezer on bottom. Filtered water /ice on the door. Entire remodel recently with pull out drawers, soft close doors fresh paint. I have a small # of books. There is a large library of books on the main floor down the right hallway from the front desk. Make sure to return or replace them please. Long, stretching the entire length of the condo. Each bedroom and the living room have full floor to ceiling glass sliding doors out to the balcony with mountain and golf views. Night city lights WOW! Tennis is available. Equipment is free. Just inquire at the front desk. golf course is nearby not on property. Seasonal, usually closes by the 1st snow sometime in late October. Opens for the season at the end of May. I provide pool towels, so please do not take the good towels down to the pool. We LOVED our stay at Hawk’s Nest! The space was perfect for our little group, two couples. And the views were magnificent to wake up to in the morning. 10/10 recommend! First rate in every way! We had a great stay and would heartily recommend it. The condo was lovely with a wonderful view of the mountains. The balcony is incredibly large to fully enjoy the view. We kind of expected this from the pictures but what we didn’t expect was how immaculate the condo is and beautifully decorated. Everything is modern and tasteful. And if that isn’t enough, if you forget anything - they have thought of it and have it there for you. These folks know how to do it. The building felt safe and secure. Parking was easy. And when I did have a question about staying an extra day, the owner was kind and responsive. Really well done! If we get back to colorado we will certainly check to see if this property is available first. Thank you so much Cal. I enjoyed corresponding with you. I look forward to the next time you come to Colorado Springs. You took excellent care of Hawks Nest. You are welcome anytime to stay. 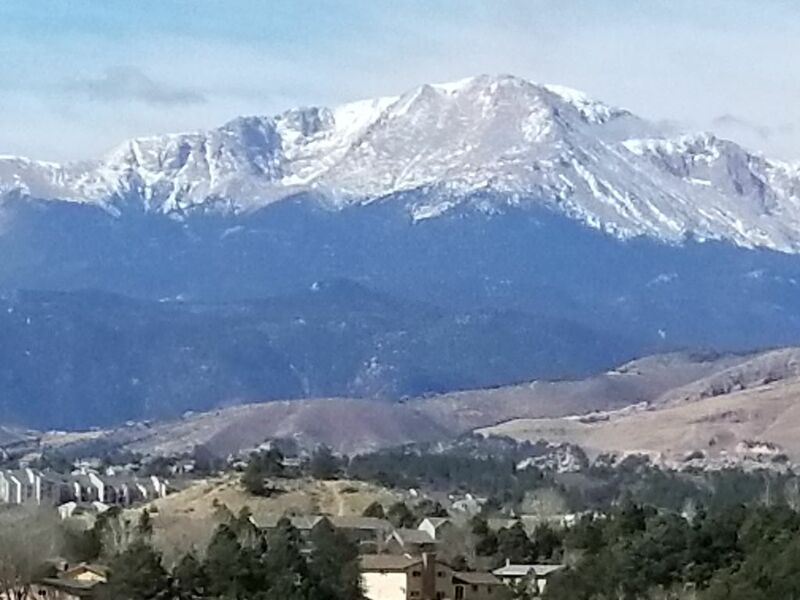 We went to Pikes Peak, Royal Gorge, Garden of the Gods, Helen Hunt Waterfall, Ziplining in Manitou Springs, Cripple Creek, Red Rock...all so easy to get to from this condo. Condo was clean and well supplied for its visitors. Well stocked kitchen. Easy parking out front. Very comfortable and the best part is the glass sliding doors out to the terrace that runs across an entire side. Great view of the mountains. Great stay!!! Highly recommend. We thoroughly enjoyed our stay. The condo was very clean, spacious and well equipped ...everything we needed except wine glasses. Very comfortable and relaxing and the balcony is amazing! The location was good with easy access to lots of restaurants, stores, etc., pretty much anything you could need. Doug was great to deal with...very quick to respond to our questions. We are timeshare owners and have stayed in numerous condo's all across the country and would definitely rate this one very high. Should our travels bring us back to Colorado Springs area, we would love to return to Hawks Nest! It was a pleasure having Mark and Vicky stay at our condo. We hope that their next trip to Colorado Springs they will once again choose Hawks Nest as their choice of stay. I am making sure to have wine glasses available for my future guests. Thanks for the suggestion. The condo was awesome! Theresa was great to work with! We really loved the condo! It was really well situated in Colorado Springs! We so enjoyed our stay! We absolutley loved staying in Doug and Teresa's condo. Attention to detail was great. The condo was well furnished. The best part was the balcony of each of the bedrooms and living room. We sat outside most the time we were there, taking in the beautiful views of Pikes Peak, Garden of the Gods. Residents of the building were very pleasant. The front desk lady, was super friendly. We also loved the pool on site. Want to say thanks again Doug and Teresa for being so wonderful to work with, and sharing your condo with us! Thank you so much for the review. We try our best to make you feel comfortable and at home. We are pleased you were happy during your stay.